So I am obsessed with Spagheti Squash right now! Quick and easy recipe! 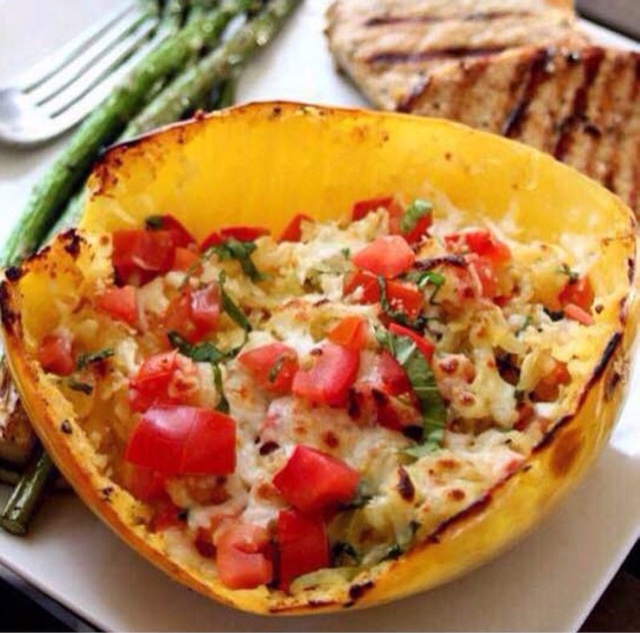 -cook spaghetti squash in microwave 4 minutes each side. Remove, cut in half, scrape out seeds. Scrape remaining squash with a fork in a large mixing bowl. Mix together, add cheese, stir and return to Spagheti bowl for a fun presentation! Great dish for the whole family because you can customise each one to their own desires ! Start your kids out right this school year with healthy eating habits! I have so many moms ask me about healthy lunches for their kids. Research has shown that a healthy and balanced lunch will increase energy, production, academic learning and psychological behavior. It does not take much just a little preparation. 1 in 3 kids are over weight. They are taking in enough calories but not enough essential vitamins, nutrients and minerals. 5 Lifestyle Habits of Healthy and Happy People… Do you follow these?! -Most people do not realize or make an effort to do a little something for themselves to improve their health and quality of living…. It does not take much! Do you have good genes in your family and eat whatever you want while doing little exercise?! Something a lot of people do not know is these people are some of the most unhealthy! High Cholesterol, Blood Pressure and Body Fat are proven to be elevated amongst people who do not exercise on a regular basis. This leads to increased risk of stroke, heart attack, and a shorter lifespan. If you have good “genes” or not… Here are 5 healthy practices you can incorporate into your daily routine to help live a long, healthy, and happy life! 1. Moderation- This is my “Formulation for Success” A healthy life style is achieved though moderation in all aspects of life! If you want the cheeseburger, EAT IT! And then be done with it. HELPFUL TIPS: Take 1/2 the bun off and save over 30 carbs. Or most every place now offers lettuce wraps that you can stuff your liking! Think every situation/ food choice through and ask your self if it is worth it in the long run… You will thank yourself after. 2. Think Ahead- Yes, we are all very busy trying to take care of our families and ourselves! HELPFUL TIPS: Plan your weekly meals on Sunday. Visit www.haleyyoung.blogspot.com for healthy meal ideas and quick on the go snacks. Having a plan is key. If you are going out to eat look at the menu before. If you are going to a “set menu dinner/lunch/shower” eat something that satisfies you before you go so you are not starving. Choose light options and still enjoy your time with friends. 3. Travel with Healthy Snacks- If you are going to the ball park, to the beach, or will be out running errands, pack a snack! This is where a lot of people get in a bind and end up settling for an unhealthy option. Quick Ideas/Recipes on my blog. 4. Journal Your Food- Your diet contributes to over 1/2 of the way you look and feel. Keeping track of what you put in your body you will realize the small little changes you can make to see big results. 5. Live by YOUR core values in both professional and personal life- There are many temptations, but you know what makes you feel good, function with the most energy and be the best you can be. So DO IT! Don’t compare your self with others. Do what makes you succeed. We are all busy and always on the go. But it is important to take care of YOU!! Do one thing and TRY IT! I am here for you if you have any questions, comments or need advice.